Come and celebrate 100 years of higher education system in Thailand and take part in a global debate on how to build more sustainable and innovative societies! The Conference programme and registration procedure are outlined on the General Conference website. Is higher education a catalyst for innovative and sustainable societies? Take part in three of the twelve parallel sessions and learn from the Case studies selected. The IAU General Conference is the decision-making body of the Association. It meets once every four years and it is on this occasion that IAU Members elect the IAU President as well as the Administrative Board members. All heads of Member institutions and organization are invited to consider running for elections to the Administrative Board (2016-2020). More information. 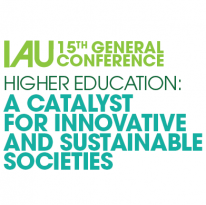 IAU Business sessions will allow all to learn about the new strategic plan and projects ahead.